Worn and discoloured teeth are whitened and made longer in these smile makeovers with cosmetic dentistry. The result is a beautiful, more youthful smile. Shows like extreme makeover have brought cosmetic dentistry to the forefront of peoples minds. 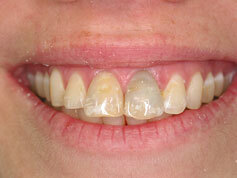 A smile makeover is a complex case which involves a series of treatments. This patient felt that her smile was spoiled by her two front teeth. We whitened her teeth using Brite Smile In-house Whitening and placed four crowns to transform her smile. Vanessa says I love them, they feel wonderful. I’m getting so many compliments on my beautiful smile – for the first time in my life. Disasters can become beautiful and functional to the delight of patients who think they are beyond help. Vince’s teeth were transformed with porcelain crowns. Vince an accountant had avoided the dentist for twenty years. All his life he wanted a smile he could be proud of. He commented that it has made such a difference for him both professionally and personally. One of Vince’s lifetime goals was to improve his smile. The excitement he felt when he saw his teeth was unbelievable. John had old dentistry that had turned drab and yellow. His grandchildren asked why his teeth were so yellow, so he made an appointment with us right away. He had a hard time finding a job as a sales representative until he had his smile makeover. John’s teeth were transformed using porcelain veneers. He is now saving to have the bottom teeth done. Geraldine is a mother and housewife who always took care of her family first. When it was finally “her time” the dazzling new smile gave her confidence and a huge boost. Geraldine’s smile was transformed with a combination of crowns and bridges. Geraldine told us that she feels 10 years younger with her new smile. 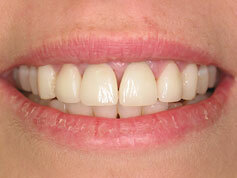 Helen had a combination of treatment including bridges and crowns. Her beautiful teeth now complete her wonderful smile. She looks years younger and she is thrilled with the result.